Whether it was a new way to fill in a pothole, erase a whiteboard, or safeguard a boat during a major storm, the fall projects displayed at Design Day last week raised eyebrows and came in all shapes and sizes. 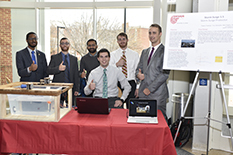 The culmination of the Department of Mechanical Engineering’s Integrated Product and Process Development Course, Design Day featured 24 teams of senior-level students who presented project prototypes built to solve selected engineering problems. The Magic Board Erasers team (Zachary Day, Kelly Flaherty, David King, Diego Lyon, and Kelsie Mathieson) designed a device called “The Click-Eraser” that allows users to erase a whiteboard with more speed and efficiency than other products on the market. The device covers the vertical length of the whiteboard and can move from side to side, allowing users to erase everything in one sweep. Team Storm Surge 1.5 (Clayton Friedman, Tony Giampietro, Nick Gregory, Divyesh Jarsanaya, Avery Lane, and Tyler Martin) addressed another problem—how to hold a boat in place during hurricane storm surges. “We use dock lines to hold the boat within the slip,” explained Giampietro. “The tension of the lines is controlled by motors that adjust the length based on water level change.” The team calls their prototype the “Storm Surge Protector,” which boasts a pressure sensor that monitors water changes and communicates with the motors. “Our scaled-down prototype demonstrated that this is definitely possible,” Giampietro added. Moving forward, the team envisions adding an app capability to check the water level and adjust the lines, as well as developing larger and smaller watercraft models. Design Day brought together a wide audience, including the campus community, alumni, family, friends, and others interested in innovation and product design. Faculty, students, and industry representatives judged the projects based on technical criteria. All visitors were encouraged to vote for their favorite project, and the teams with the majority of votes were honored with the People’s Choice Award. This year, a team called Paw Patrol won first place in the People’s Choice Award. Paw Patrol developed an automatic animal trap— “The Really Awesome Product (T.R.A.P. )”—with remote notification and interfacing capabilities. Team members include Jessica Brewer, Jennifer Goleman, Kellie Martin, Gray Matty, Sahar Motazedi, and Patrick Talsania. Team Wheelie Awesome (Tim Czupich, Michael Healy, Nathan Mengers, Jeff O'Neal, and Lizzie Wink) won the Social and Environmental Design Impact Award, which is jointly supported by the Department of Mechanical Engineering and the Office of Sustainability. The team designed an automated bicycle chain cleaning mechanism (also known as “The Wheelie Awesome Chain Cleaner”) that degreases and lubricates a dirty bicycle chain.